​The best prevention of head lice is to perform weekly checks on your own child(ren) to look for lice and nits. Make head checks a part of your family’s personal hygiene routine. Watch for signs of head lice, such as frequent head scratching. Anyone can get head lice, from another person or from sharing hats, brushes, combs, etc. Check all family members for lice or nits (lice eggs) at least once a week. It may be helpful to use a bright light and a magnifying glass. Remove all nits from the hair; they may stay on the hair even after treatment. Treat only those family members who do have lice. Buy a lice product at the drug store, call your doctor or school nurse for more information. Follow package directions carefully. Lice spread from person to person when people are in close contact or when they share clothing or personal items that have been in contact with the head or neck of a person with head lice. Sleepovers are the number one place where head lice are spread. Lice do not fly or jump: they can only crawl. Check the entire head. Lice like to lay their eggs behind the ears, on the back of the head above the neck and on the top of the head. But you might find adult lice anywhere on the head. The best way to remove nits is pulling them out with your fingers. Check for head lice once a week. Fridays are a great day to check heads. 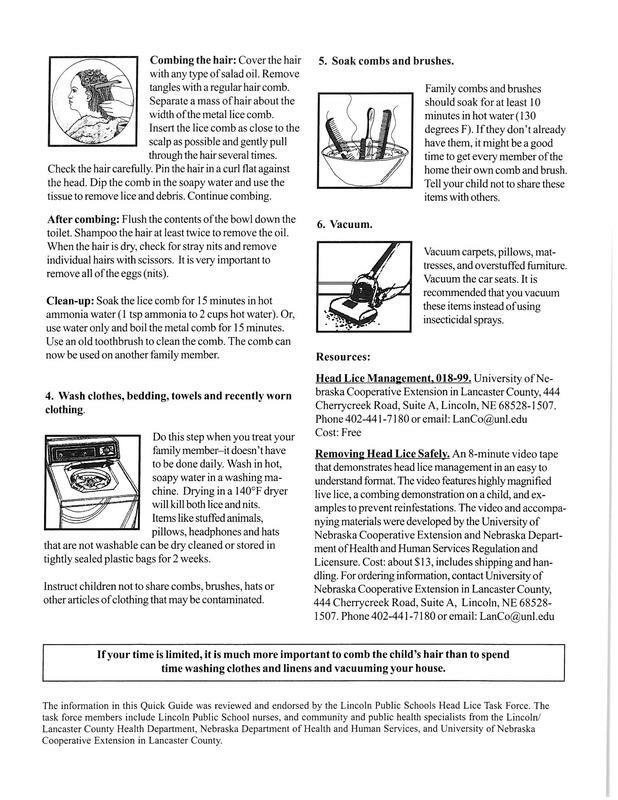 If you find lice, you can start treating over the weekend and your child(ren) will avoid missing school. 1. Until a few years ago, approaches to head lice were based on old wives tales, misconceptions and marketing departments for the companies who made products for profit from Head Lice Hysteria. Luckily, we now have research upon which to base our practice. Thank you, Harvard ! 2. Head lice are not a sign of uncleanliness; they love clean hair because it is easier to latch on. 3. Lice do not hop, jump or fly; the only way they can get from one person to another is direct touching, head-to-head. 4. Lice are not passed on pets. The only place head lice can survive and thrive is on the human head. 5. When found, most cases of head lice are already more than a month old. One sign is a red itchy rash on the lack of the neck, just below the hair line. 6. Because of use and overuse of head lice shampoos, head lice have become resistant to the products that once would kill them, so no head lice product is 100 % effective, even if you follow the directions to the letter. That is why combing and nit removal is important. 7. Never treat or retreat "just in case" in the absence of live lice. Head lice products are pesticides, which are toxic if overused and can be absorbed through the skin. Follow the directions carefully. 8. Removing the nits (eggs) and live lice with a special metal-tooth comb is time-consuming but the most effective way to get rid of them. They do not wash out. 9. Hats and coats touching in school are not sources of lice and there is no need to separate or bag them. A louse on a hat or coat is a dying louse who will not be capable of reproducing. Healthy ones stay close to the scalp until they sense another human head. They cannot survive without blood, that is why they bite. 10. Head lice are not a source of infection or disease; they are simply a nuisance. 11. Schools are not the most common places where head lice are spread, even though schools have been blamed in the past. Sleep-overs among friends and relatives are thought to be a common way they are passed home to home. 12. School-wide head checks are not recommended or endorsed by the Harvard School of Public Health, the American Academy of Pediatrics or the Centers for Disease Control. The most effective screening occurs when parents check their own children at home, treat if any are found, and make efforts to remove the nits. 13. One of the biggest challenges in eliminating head lice is parents' discomfort in communicating about the problem with other parents when they find head lice, so they are more easily passed back and forth among close friends and relatives. 14. "No-nit" policies, ie. not allowing children back into school with nits even though treated, is no longer practiced in most schools because it has been proven that these policies do not impact the spread of lice. 15. You will always be able to find web sites that promote drastic measures like sprays, special products and "no-nit" policies. Pay attention to who they are! Many of these web sites are either not basd on up-to-date research or are commercial sites are in the business of selling a product, and it is in their interests to keep Headlice Hysteria alive, otherwise there go their profits. 16. Nit and lice removal is tedious but there are some simple products that may help. Vinegar, real mayonnaise, olive oil and Dawn Dish soap all have their fans, even though none of these have been proven. The way they seem to help is to loosen the "cement" that the nits use to attach to the hair shaft. 17. Shaving the head or cutting the hair will not affect how easily a child catches lice, though these make nit removal easier. Don't do this unless your child wants you to. A child's self-esteem is much more important than a few missed nits. 18. Grandma's old remedy of kerosene for head lice does not work and is dangerous! Children have died from inhaling the vapors, or from being burned because it is highly flammable. Never use kerosene! 19. Most schools want children with head lice treated and back in school right away. 20. School nurses are supportive advocates who will help you obtain lice shampoo and use it properly. School nurses will assist you in checking or rechecking as you work to remove nits and lice from your child's head. Just ask. 21. School nurses will not judge you or report you or tell others if you ask for assistance dealing with head lice. We handle lice in a confidential manner. We know that even the best families can catch them, and most of us who are parents have been through it at least once ourselves.